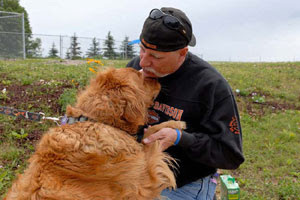 Friends of Flicka sponsors a golden retriever named Megan at Home for Life Sanctuary. Here is her story from the Home for Life website. Megan in the Fall of 2007 with animal care specialist Liz Zais. Megan is a Golden Retriever who came to Home For Life® at age 1-and-1/2 through the Golden Retriever breed rescue and a local vet. The breed rescue did not believe Megan could be placed as she had a bite history. However, the vet who evaluated Megan's temperament detected vestiges of a kind heart and great intelligence, and felt that Megan deserved another chance at her young age. Dr. Petra Mertens, a behaviorist at the University of Minnesota Veterinary Teaching Hospital, evaluated Megan at our request. Dr. Mertens felt that Megan was a dominant dog, but had a good heart. It turned out that two previous owners had treated Megan very roughly and unfairly in trying to discipline her natural, youthful canine exuberance. Megan bit back in protest. Still another owner, at her third home, had been bitten during the course of play that got out of hand. While biting is never permissible behavior in dogs, it was still felt that Megan could be rehabilitated, and Home For Life® decided to give her a chance. Fortunately, with gentle and consistent handling, as well as weekly obedience lessons with Jan Tomlinson of Canine Sports and Training, Megan learned novice-level obedience, and has become reliable for our staff to handle. She even participates in the Renaissance Program and was a great hit during the presentation at a nursing home. Megan talks heart-to-heart with a visitor at the 2006 Poker Run for Paws event.